You know all of those times when you’ve jokingly said something along the lines of “I really could use an extra set of arms”? 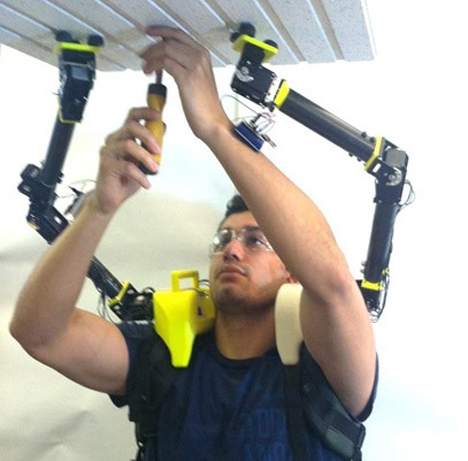 MIT researchers are making that half-serious dream come true with their “supernumerary robotic arms”” – an extra pair of arms that sit on the shoulders of the user to provide extra holding help. The project focuses on warehouse, factory and construction workers who are routinely tasked with jobs like holding an object overhead while drilling it into place. While it can be done by one person, it’s a pain to accomplish. The MIT team think that they can make such tasks go much faster by simply giving workers a couple more arms. 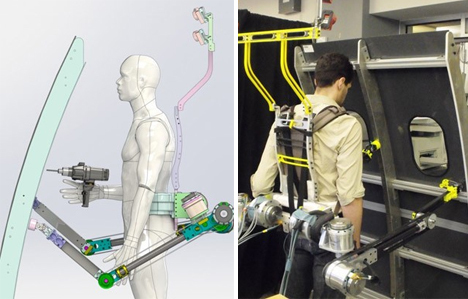 The extra arms consist of two robotic limbs attached to a lightweight backpack. The weight of the arms is distributed comfortably on the spine so that the wearer experiences no fatigue or pain associated with the Supernumerary Robotic Limbs (SRLs). When working on a specific task, they don’t have to be controlled by the wearer – they are programmed beforehand to provide the necessary support. The robotic arms are taught their tasks by a second human moving them into place while the job is being performed. After the “training,” the arms remember their job and perform their tasks without further intervention. The SRL team used the example of a factory worker who installs ceiling panels in airplanes. To do this, a worker needs to hold the panel in place overhead and use tools to attach the panel. This is ordinarily a headache, but with the robotic arms holding the panel in place the worker is free to do his or her job without worrying about the panel falling down. Another application being considered for the technology is to keep workers steady when they are climbing or just need extra stability. In this case, the arms would be attached around the worker’s waist. 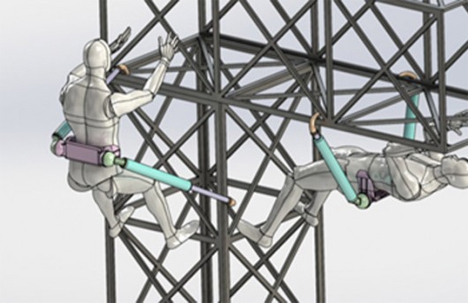 They can either stay stable, just holding the worker in the correct position, or they can be programmed to help with actions that require a bit more precision such as guiding a tool or a specific part into the right location. As with other “exoskeleton” or augmented human technology, this concept could also easily be modified to help elderly or disabled people perform tasks that would otherwise be difficult or impossible.